I yet remember taking my son when he was five years old to our family paediatrician, who said, “If you don’t make him active, he will be a diabetic in three to four years.” The only sport I knew was karate and his life of being a martial arts student came into being. Today, at the age of 15 years, he is out of the crutches of the diabetic condition and has gone on to captain the Sri Lanka Karate Cadet team representing the country at regional and global level. He is a double medallion at South Asian Karate championships, International medallion and ranked 11th in the world by WKF (World Karate Federation). In this backdrop, when I saw on media that a 934th ranked player had gone on to win the US Women’s Tennis title after coming back from a 11-month break due to an injury it caught my eye. Let me do a deep dive on this personality, Sloane Stephens. Born in Plantations, Florida on 20 March 1993, currently she resides in Coral Springs, Florida. Started playing tennis quite late in life at the age of nine which was introduced by her mother and stepfather. At the age of 12 Sloane stepped up her training routine and joined the elite Tennis Academy and switched to online home schooling. The 23-year-old was ranked 934th in the world before winning the US Open in 2017. Today she has made it to the 26th in the world ranking. Some speculate that she will be ranked 15th within the next two weeks. Let me pick up the top six lessons for parents who are raising a sports star child. Sloane Stephens, just like any other child athlete, comes from a home where the parents live an ethos of a sportsman-like life. Her mother Sybit Smith is a professional swimmer with seven school records under her name and is considered one of the top swimmers that University of Boston has produced in recent history. The father was a football star but died at the early age of 43 in an accident. Pickup 1: Having to go through pain to gain and with gain to win are lifestyle driven values that come from parents. Weather and off days are not in the vocabulary of the parents that bring out a child sportsman. The discipline of eating and managing weight to achieve the desired result in the game go hand in hand with the daily training one learns more at home than at practice. Social dinners and get-togethers are low in priority in the daily lives whilst going for training is more important and becomes a way of life. I yet remember my son once telling me when he was just eight years after a tournament, “Dada I disappointed you today.” Handling such moments are what makes a winner of tomorrow in my mind. Apparently, Sloane’s role model of life was another Afro-American Serena Williams in particular, though both William sisters were close to her heart. Sloan had a poster of Serena in her room but once when she wanted an autograph the William sisters passed by her three times in one day and had not given her a signature; she tore down the poster and decided not to follow the idol. The biggest achievement in her life was when Sloane beat Serena at the Australian Open and made it to the quarter finals. Pick up: Being an athlete, one always has a role model. A parent can influence a kid by getting a grounded star so that shaping of the behaviour can happen sharper. I was able to touch base with an Asian champ in karate called Saadi Abbas who is ranked in the top three globally to meet my son. Today, I find that his attitude to life is shaping on the role model. 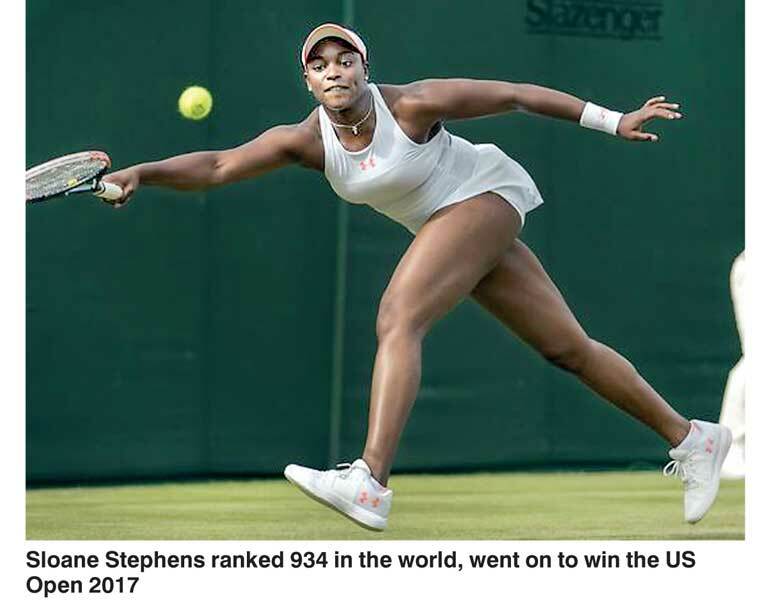 In the case of Sloane Stephens, her will power was so strong she beat her at the game and then partnered Serena for the Rio Olympics, which is the mentality of a world performer I guess. Rumour goes that Sloane is romantically linked to US Men’s soccer star Jozy Altidore. She met him when he was suspended at one time from the team and was seen watching Sloane play tennis in Canada. The couple never talk about it openly but some media speculate this. Pick up: A tough one for a parent to handle. Almost like letting go when a child is riding a bike for the first time. For sure the fellow will fall down. But you have to see the child through. I encourage group outings so that it is not obvious but this is an important part in growing up of a child who has only sports and studies in his 14-hour daily routine. Pick up: Any athlete will go through injury. It’s tough for a parent as you see the dreams that a child had when you talk and see the eyes filling with tears. But, you have to keep the spirit excited. You have to talk of the future ahead and how the injury is going to make one stronger. Sloane’s coach had mentioned that when she got back to tennis the will to win was greater as she was out of the game for so long she realised what she missed all that time. It’s almost a second life, one gets to appreciate your talent. I guess when God takes away a talent and then gives it back, you are more appreciative of what you have that you always took for granted. Pick up: Sloane’s mother focused the kid on the challenges on the tennis court and never discussed what the media reported or what the neighbours said about her. I guess this is a very impactful strategy so that it is easier to manage the child, especially if he commands respect at school. This is why Sloane was stunned when she saw the $3.5 million cheque after winning the US Open title. A very tough issue to manage once making it into the media is how you manage the money and fame tied to lifestyle brands. Sloane was signed up to IMG as soon as she won the US Open. This brought her on par with Serena Williams, Novak Djokovic and Peter Kvitova. Her mum always tells her “focus on the game of tennis and let other things follow you, not the other way around”.